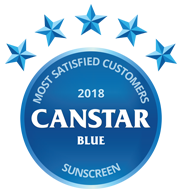 Compare Sunscreens in New Zealand with Canstar Blue. Neutrogena, Banana Boat, Cancer Society, Garnier AMBRE Solaire, Nivea and SunSense were compared on value for money, texture and consistency, effectiveness, scent/smell, packaging/ease of dispensing, ease of absorption and overall satisfaction. From selling soap in the 1950’s, global giant Neutrogena now prides itself on developing and delivering products that never go out of style. Damage from the sun is one of those things that a lot of people seem to have a mental block on. The sun is natural and being outside is good for you, right? Unfortunately, when it comes to the sun, you can have too much of a good thing and resulting damage to your skin can not only cause painful sunburn in the short term, but can result in skin cancers such as melanoma, in the long term. Sadly, here in New Zealand, we have the highest recorded rates of melanoma, in the world. Using sunscreen and covering up with UV protective clothes and hats can quite literally be a lifesaver, but it’s important you use the correct SPF. SPF is short for Sun Protection Factor and is how protection from harmful Ultra Violet B (UVB) rays is measured. All sunscreens have a SPF which is an indication of how long it will protect your skin from (UV) burning. For example, if burn time is estimated to be 10 minutes and you use an SPF 30 sunscreen, your protection time will be 300 minutes or five hours. In New Zealand an SPF of at least 30 is recommended as this will protect you against approximately 97% of UVB rays. Also be aware that swimming or surfing will wash a lot of the protective screen off your skin – as will sweating – so ideally you should reapply every couple of hours. We’re pleased to report that 75% of the sunscreen wearing Kiwis we asked, reported to use a SPF 30 or above but only 29% of people said they reapplied it throughout the day. However, a worrying 36% of people said they often went out in the sun without applying sunscreen at all. Out of these, 55% said it was because they would simply forget, but 29% said they thought it wasn’t necessary because they weren’t spending all day in the sun. Unfortunately, the idea that you need to be out all day to put yourself at risk, is misguided. Global consensus is that 20 minutes is the maximum time you can spend in the sun safely without sun protection, however, New Zealand’s harsh UV is considered to be approximately 40% more harmful than it is in other parts of the world meaning our ‘safe’ window is even smaller. In addition to UVB, the sun’s rays also contain UVA. UVA rays penetrate deep into your skin and are responsible for causing signs of ageing such as wrinkling and age spots. Unfortunately, there’s no sunscreen that can yet protect you against UVA, hence the importance of covering up with tops, hats and sunglasses in the sun. Sunscreen works in two ways. Firstly it ‘reflects’ UV rays away from your skin, and in addition (and without getting too sciency) it can also absorb some of the UV radiation, further protecting your skin. The UVB rays we talked about earlier (the ones that are responsible for sunburn) are what your sunscreen will protect you from and, as we said earlier, in New Zealand you should use an SPF of at least 30 and apply generous helpings at regular intervals of around every two hours. We asked Kiwis how satisfied they are with their most recent sunscreen brand, and identified the greatest drivers of customer satisfaction Unsurprisingly the first thing on the priority list was effectiveness. Obviously, when you’re buying sunscreen to protect yourself from the sun, how well it works is important! Neutrogena was the only brand in this category to receive a five star rating. The next most important qualities rated were value for money and ease of absorption. SunSense represented the brand that was considered to give best bang for buck with a five star rating in value for money and Neutrogena was again the only five star recipient when it comes to ease of absorption. Texture and consistency, packaging and ease of dispensing and smell/scent were considered the lesser drivers of satisfaction but again, Neutrogena received five stars in these categories. SunSense also recorded five stars for texture and consistency and Banana Boat received their only five star rating for scent. Despite the regular media coverage, government and health campaigns around keeping ourselves sun safe, 32% of the people we spoke to still admitted to liking having a tan. When we asked why, 58% said it makes them feel healthier. In reality of course, tanning our skin is not a healthy thing to do so limiting your time in the sun and covering up with sunscreen, a top, hat and sunglasses is definitely the right thing to do. Quite a bit as it goes. Hats are a great idea as they protect your head and can provide shade for the face. Dark coloured tops (preferably long sleeved), tee-shirts and rash vests can also offer protection – especially if they are made of a tightly woven fabric. The most protective clothing is made with ‘built in’ Sun Protection Factor (SPF) and you should be looking for something that is at least SPF 30. You can’t apply sunscreen to your yes and they are just as vulnerable from UV rays so a good pair of sun glasses is a must. Most will protect from UVB but check the label to make sure you’re buying a pair that also protect from UVA. Even with hats and appropriate clothing, our primary line of defence should always be a good sunscreen, also sometimes called sunblock. It should also be applied at least 15 minutes before your go outside. Specialist GPs who are trained in trained in dermoscopy (the use of a special magnifying instrument called a dermatoscope to examine skin lesions). Dermatologists (skin specialists). Your doctor can refer you or you can make an appointment directly. Skin specialists such as surgeons. Various mole or skin check services are available. 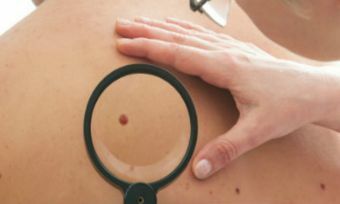 Many use technologies such as whole-body photography, digital dermoscopy and computer-based monitoring to track skin changes over time. We recommend you read skin check service websites or printed information, and don’t be afraid to ask questions about cost and what to expect. Canstar Blue commissioned I-view to survey 2,500 New Zealand consumers across a range of categories to measure and track customer satisfaction. The outcomes reported are the results from customers who have purchased and used sunscreen in the last 12 months, in this case, 1,494 New Zealanders. Sunscreen can be a real headache when it gets on clothes. Fortunately we have some great tips to help you remove those oily stains. You have most likely experienced sun burn before. So what causes sunburn and is there a cure? Who are the country's biggest sun tanners? Despite the well-known dangers, that's not enough to stop Kiwi's from getting out in the sun. Our survey reveals who is really soaking in the rays.